Members of the Victorian British Royal Family, were animal lovers and fanciers across a wide number of disciplines, including poultry, dogs, game, cattle, birds and of course, cats. Although the Queen did certainly own Persian cats, in most cases these were generally gifts from her subjects. 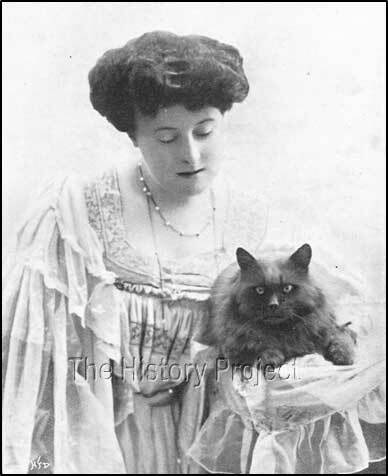 The true cat fanciers amongst the immediate family members, included her grand-daughter, the Princess Victoria of Schleswig Holstein (from Prince Christian of Schleswig Holstein and the Queen's third daughter, Princess Helena of the United Kingdom); and her daughter-in-law, the Princess Alexandra, (the Princess of Wales), who although an avid dog fancier, did take an active interest in cats and their welfare. 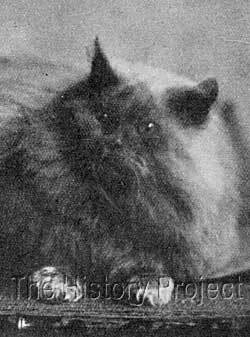 The young Princess Victoria, in particular, was a Patron of the Chinchilla Cat Society and an active breeder and exhibitor of Blue Persians, Silver Tabbies and her beloved Chinchillas. 'Royal Bobs' is just one of a number of Blue Persians and Chinchillas that she bred and which were exhibited competitively. 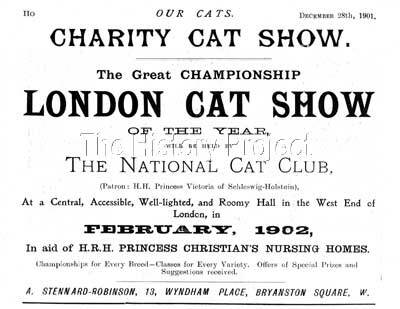 By the turn of the century, she was Patron of the National Cat Club which, on a number of occasions, held Charity Cat Shows, just one of which was in aid of H.R.H. Princess Christian's Nursing Homes. The date of birth for 'Amesh' is given as 5th October, 1900. (BCC:386 and USR:158). He was bred by HRH Princess Victoria of Schleswig-Holstein, being sired by Lady Marcus Beresford's well-known blue male 'BLUE BOY II' (1897) (NCC:3045) and out of the Princess's blue queen 'DUSCHAR' (c1898)(USR:167). (aka 'Dashoor'). 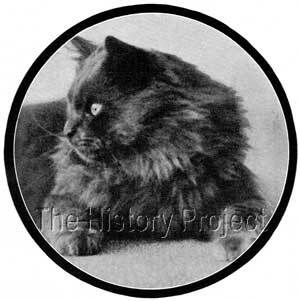 The sire of 'Duschar' was 'Fulmer Roy' a grandson of two of the most popular Champion Blue Persians, 'Ch. Bundle' and 'Ch. Wooloomooloo'. 'Fulmer Roy', was also the sire of another extremely popular and particularly handsome Blue male, 'Champion Skellingthorpe Patrick', who was a major winner in his day, and therefore, by virtue of his sire, a sire-sibling to the Princess's 'Duschar'. 'Amesh' appears to have been one of a litter of at least three, which included another blue male 'Royal Bobs' and their litter sister 'Jill'. 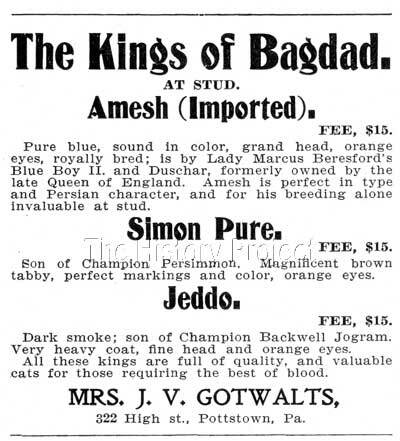 In due course, 'Amesh' was exported to the United States, to the 'Bagdad' cattery of Mrs. J.V. Gotwalts, of Pottstown, Pennsylvania. 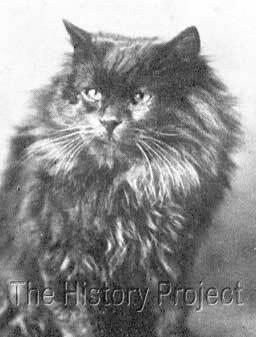 He was then registered with the Beresford Cat Club under the name of 'Bagdad Amesh'. In a stud advertisement shown below, he is advertised as 'Amesh' (Imported)...... "Pure Blue, sound in color, grand head, orange eyes, royally bred; is by Lady Marcus Beresford's 'Blue Boy II' and 'Duschar', formerly owned by the late Queen of England. Amesh is perfect in type and Persian character, and for his breeding alone, valuable at stud." 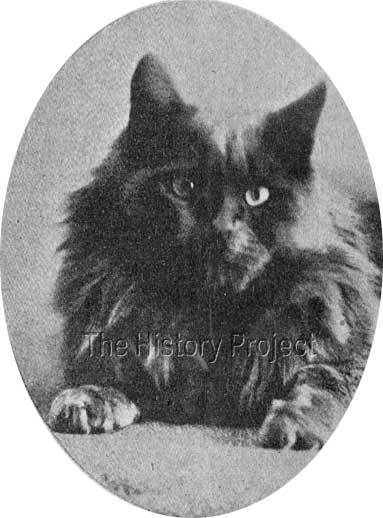 'Amesh' was one of a number of imports into the 'Bagdad' cattery, another notable one being 'Simon Pure', the Brown Tabby son of Miss Simpson's famous Brown Tabby, 'Ch. Persimmon'. Left: Sire of 'Amesh', 'BLUE BOY II' once owned by Lady Marcus Beresford. 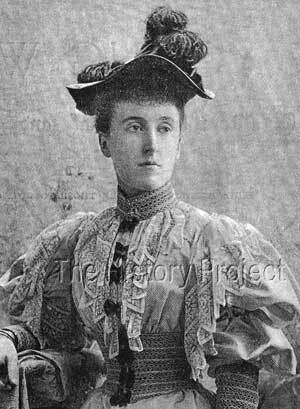 'Amesh' had at least two full siblings, the most notable being 'Royal Bobs', who became the property of Mrs. Collingwood of Leighton Buzzard. 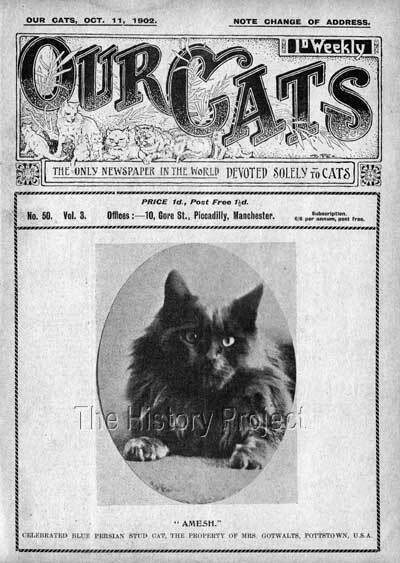 In Our Cats and All About Them (1902), Frances Simpson describes 'Royal Bobs' as "a dark slate blue, 'but very sound in colour, with a beautifully shaped head and fine eyes...." And it is from the same source that we are given some of his show records: "In 1901, he took 1st in the Cat and 1st in the Kitten Class. Since then he has taken four other 1st prizes and two championships, besides many specials." It would appear from the photographs at least, that the grandsire, 'Fulmer Roy' was a darkish blue and that both his grandsons inherited trait. But from the commentary of Miss Simpson, although the shade of blue was darker than the ideal, it was none-the-less very sound. It is interesting to note, however, that 'Skellingthorpe Patrick' was known for his very light, even and luxurious blue coat. 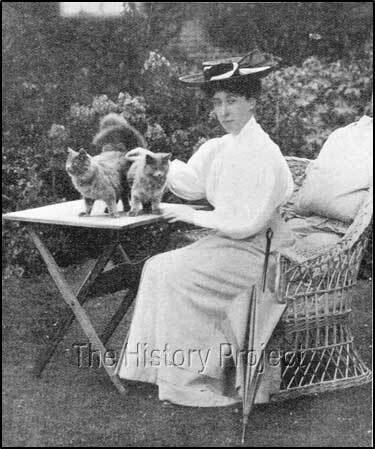 "Mrs. Collingwood of Leighton Buzzard, is a most ardent lover of cats, but it is only of recent years that she has been before the public as a fancier and exhibitor. During this time, however, many have been the honours showered on the lucky inmates of the Bossington cattery. Mrs. Collingwood has great difficulty, so she tells me, in keeping her number of cats down to thirty! She likes these to be equally divided between long and short-haired pussies; so there are all sorts and varieties. "Royal Bobs", a big, massive blue male, has done a lot of winning. He was bred by the Princess Victoria of Schleswig-Holstein. His sister 'Jill' also inhabits one of the twelve cathouses, distributed over five acres of the Bossington grounds." 'Amesh' the property of Mrs. Gotwalts, Pottstown, USA. Twin Roses on one stem, blue Persian Kittens from 'Cumberland Lodge', the cattery of HRH. Princess Victoria, in Great Windsor Park. 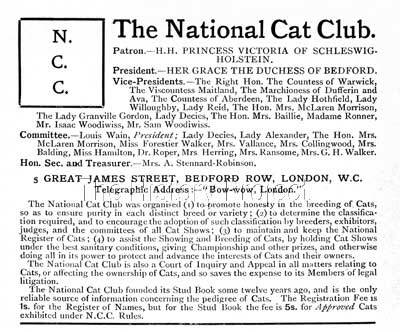 Advertisment for The National Cat Club, with Princess Victoria as Patron and the Duchess of Bedford as President, 1902. Cover page of Our Cats Magazine, featuring 'Amesh'. 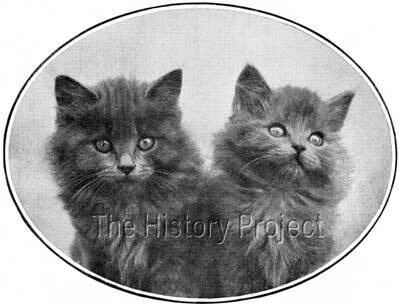 Not many breeders could lay claim to ownership of cats bred by members of the extended British Royal family, but certainly Mrs. Collingwood and Mrs. Gotwalts could do just that, and did. However, doing so does not guarantee success, and with the exception of Princess Victoria's chinchilla lines, we have not yet been able to trace any descendants down from the 'royal' line of blues. What was more important in this case was the real and implied endorsement given by members of the Royal family, including Queen Victoria, and later Queen Alexandra, to the hobby of Cat Fancying. This was tacit approval in the eyes of the public, that Cat Fancying was in fact a respectable sport. And this endorsement also came in the form of Vice-regal support, in the active participation of Lady Aberdeen, of 'Haddo House', whose cats were also seen at shows, and whose bloodlines did indeed stand the test of time and can be found on the pedigrees of blue Persians to this day. "It gives me the greatest possible pleasure to place on record, in illustration of the many admirable humane qualities that characterise Her Most Gracious Majesty the Queen, that she personally remarked at the jubilee meeting in London of the Royal Society for the Prevention of Cruelty to Animals: 'No civilisation is complete which does not include the dumb and defenceless of God's creatures within the sphere of charity and mercy.